The Oceania-themed issue of the long-running Kiwi literary journal brief is finally running off the press this week. 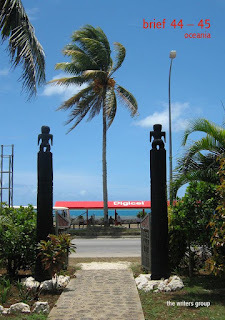 I snapped the photo on the cover (click to enlarge it) of brief 44-45 last year, while standing on the doorstep of the Tongan Visitors Bureau in Nuku'alofa, looking down a concrete path through a pair of pillars topped with statuettes of (I think) Hikule'o, who was the goddess of Pulotu, an underworld, or otherworld, which might be reached, in pre-Christian times at least, through portals which appeared in cemeteries or on lonely roads at night. Hikule'o stares across Vuna Road, which is a pleasant seaside route that that gets jammed with cruising teenagers on Friday nights. Perhaps we could call it Nuku'alofa's answer to Auckland's Tamaki Drive. On the far side of Vuna Road punters are sitting about at the Nuku'alofa Central bus station, protected from the January sun and from falling coconuts by a tin roof kindly provided by Digicel, a mobile phone network provider which began operations in the Carribean and has since been island-hopping its way through the Pacific. Digicel specialises in entering small, newly liberalised markets, and it celebrated its launch in Tonga in 2008 by bringing pop star Shaggy to play in Nuku'alofa. Since last year Tongans have been able to pay their bills and transfer money overseas using the Digicel network. For people frustrated by a decrepit landline phone system and an erratic public service, Digicel has become a symbol of hypermodern efficiency. Digicel's only real local rival as a mobile network provider is the Tongan Communications Company, the royal-controlled outfit which relies for most of its revenue on its monopoly over landline services. For Tongans, then, choosing Digicel over TCC can be a way of expressing dissatisfaction with an ossified social structure, as well as with an ossified communications system. The Tongan bus network operates according to an etiquette which is, at first, hard for outsiders to grasp. There are no bus timetables, and no scheduled arrival or departure dates. Generally, a bus leaving Nuku'alofa for the countryside will wait at the central station with its engine running until it has a respectable number of patrons, even if it has to wait for hours. The bus driver must not be paid until the very end of a patron's journey. Gaggles of giggling teenage girls are allowed, and perhaps even encouraged, to use up their Saturday afternoons riding for free at the front of the bus playing local hip-hop out of bop-blasters. They ride the same routes again and again, and never seem to stop giggling for long. Beyond the gravel of the bus station is the scoria seawall of the Vuna waterfront, and the pale blue water of Nuku'alofa harbour, where ships carrying bananas and used cars have to zig and zag between islets of coconuts, rusting shipwrecks, and the rotten teeth of a coral reef. At the end of World War Two American troops marked their departure from Tonga by pushing scores of trucks, tractors, jeeps, and feld guns over the Vuna Road wall and into the warm shallow water. After occupying and forcibly modernising Queen Salote's peaceful kingdom, the boozy, trigger-happy Yanks were apparently determined not to leave any of the fruits of their industrial civilisation to locals. Out beyond the seawall, amidst the slowly disintegrating weapons of a half-forgotten war, Tongans go wading and foraging for seafood at low tide, leaving their SUVs and patched-up Valiants unlocked and running beside Vuna Road. For me, at least, the photo on the cover of brief 44-45 embodies some of the complexities and contradictions which make Oceania a fascinating part of the world. A launch party for brief 44-45 will be held soon in Auckland. If you're keen to come have a beer or bowl of kava, send me an e mail at shamresearch@yahoo.co.nz and I'll offer directions. is richard taylor in it? Call us at We24Support canon printers support number at 1-866-978-0799,Enhance your system functioning and keep it clean with We24Support services.